The Satellite Sentinel Project acquired imagery of the explosion that rocked Khartoum, the capital of Sudan, just after midnight on October 24, 2012. 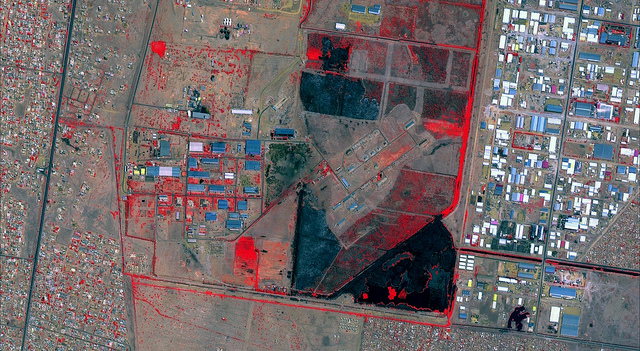 Though the source of the explosion and fire were not immediately apparent, expert analysis of DigitalGlobe satellite imagery shows evidence to indicate that the explosions were in fact the result of aerial bombardment. Within 20 minutes of the explosions, SSP communicated with eyewitnesses on the ground, who reported seeing flames, smoke, and “many explosions” in the al-Shagara neighborhood of southern Khartoum in the vicinity of an oil storage facility, a military depot, and an ammunitions plant. SSP received reports that the sky was “red from fireballs,” and that three fighter jets were “flying fast around southern Khartoum, to the northwest and northeast,” as a fourth, larger plane flew to the northeast at a much higher altitude. Local news first reported that a fire started at the Central Gas and Oil Station, and then spread to the nearby Yarmouk Military Base and adjacent ammunition plant; however, within hours of the explosions, Sudanese officials were claiming that Israel was responsible for the alleged attacks. At least six impact craters, each approximately 16 meters wide, are visible near the epicenter of the explosions and are consistent with craters created by air-delivered munitions. If the explosions resulted from a rocket or missile attack against material stored in the shipping containers, then it was an effective surgical strike that totally destroyed any container that may have remained and the adjacent 60-meter-long, shed-style building. In addition to the destruction of the 60-meter-long ammunitions factory building, approximately 40 shipping containers and 21 surrounding buildings were also destroyed. In total, 60 percent of the ammunitions factory on the military base was destroyed and 40 percent was partially destroyed. Sudan has accused Israel of sending four military planes to take out the complex, possibly in retaliation for Sudan’s alleged support, via weapons smuggling, to Hamas in the Gaza Strip through the Egyptian Sinai desert. The ammunitions factory is suspected of being operated by Iran's Islamic Revolution Guards Corps to produce weapons for Hamas. Since Israel cannot attack Egypt directly without violating a 1979 peace accord, it is suspected that Israel is now targeting countries on Egypt's periphery, like Sudan, that is suspected to have links with the Sinai militants. In the instance of the October 24 explosions, Israel neither confirmed nor denied carrying out the attacks. It has also been posited that the attack on Khartoum was a "live-fire practice run" in preparation for Israel to attack Iran; however, according to a retired Israeli official, "Israel isn't 'signaling' to Iran, just as it's not 'signaling' to the terrorists in Sinai…Whatever actions might be taken in Sudan are taken to counter a real, immediate threat." Much of the international reporting on the incident in Khartoum drew on the images produced by DigitalGlobe and released by SSP, including the Associated Press’ breaking news coverage of the development, ABC News’ reporting on the explosions, and BBC’s follow-up report about Iranian naval vessels docked at Port Sudan. Download Satellite Sentinel Project’s situation report to view the imagery: "Explosions in Khartoum."